Rethinking Faith and Church: Has "Religion" Become A Dirty Word? I think you are right. “Religion” has morphed into something else. That is why many evangelists, like me, speak more of the “relationship” with Christ as opposed to the “religion” of Christianity. It distinguishes our God from all other gods in that, while faith/belief in Jesus is the key to entrance into Heaven, it is a relationship with Him that is proof of that faith/belief. Similarly the word “tolerance” seems to have morphed. It used to be that “tolerance” meant we would “put up” with another person’s idiosyncrasies and ideas in spite of the fact that they may grate on our very being. Today we are deemed “intolerant” if we do not promote the expressions of, or otherwise accept, someone else’s point of view in spite of how vastly different it is from our own. Accusations of bigotry soon follow. Yes, how we define Religion changes how we use the term. 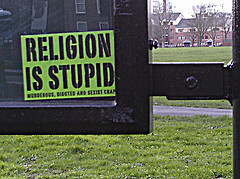 I enjoyed "End Of Religion" by Bruxy Cavey (another fellow Canadian eh?). If religion is a system of beliefs and the institutions that maintain them... we'll I'm not sure if Jesus was into that type of religion. However if religion is about caring for those in need as James 1:27 speaks of, then sure lets embrace it. Thanks for the visit and the comment. I appreciate it.